This issue SIN sat down with Áine Cooney and Mary Clare Tehan to get the inside scoop on our very own Dramsoc. I am the auditor of Dramsoc, which means I run the society with the Vice-Auditor, Mark Fitzgerald. We oversee everything that the society does, make all the decisions for the society with the committee, produce all the shows, and help all of our fantastic committee do their respective jobs! Being Auditor basically means you’re the face of the society and you need to know what’s going on with all the shows and events, and you’re the one everyone turns to with any questions or queries they may have about Dramsoc. I am so lucky to have such an incredible Vice Auditor in Mark, and we have an impeccable committee this year that are all working so hard to make the society the best that it can be, I don’t know what I’d do without them! I’m head technician so I’m basically in charge of the maintenance of the theatre. I find that some people want to join Dramsoc but think that it’s all about acting or that only a certain type of person gets involved, but it’s such a broad playing field and there is such a variety of personalities involved that it’s impossible to not find something you’d be interested in or someone you’d like to work with. It’s all about giving people opportunities to get involved, you know yourself there’s so many more ways to be a part of it than just acting. Mary Clare, what are the unique challenges of being head technical director? What led to your interest in this? Mary Clare: In first and second year I never really got involved with the tech side of things. In third year, I spent a semester studying at UNC Chapel Hill in North Carolina where I had a lot of exposure to the technical side of theatre and I really enjoyed it so I wanted to try and start getting involved with that kind of thing when I got back to Ireland. The main difficulties or rather fear is that there’ll be an issue I won’t be able to deal with but I don’t worry too much because the Drama department keep a close eye on the theatre so if anything is wrong that we can’t fix they’re there to help. The committee are such a help too, like I know I’m on the committee, but from the perspective of a society member that’s having an issue, the committee do everything they can to help, like I imagine the theatre would’ve burned down now if it wasn’t for everyone pitching in and helping out. So what has Dramsoc been up to this year? Áine: So far this semester Dramsoc have done a Summer play, a fresher play, a collaborative musical with GUMS, five first semester plays as well as an event every week, ranging from workshops to mixers to parties! 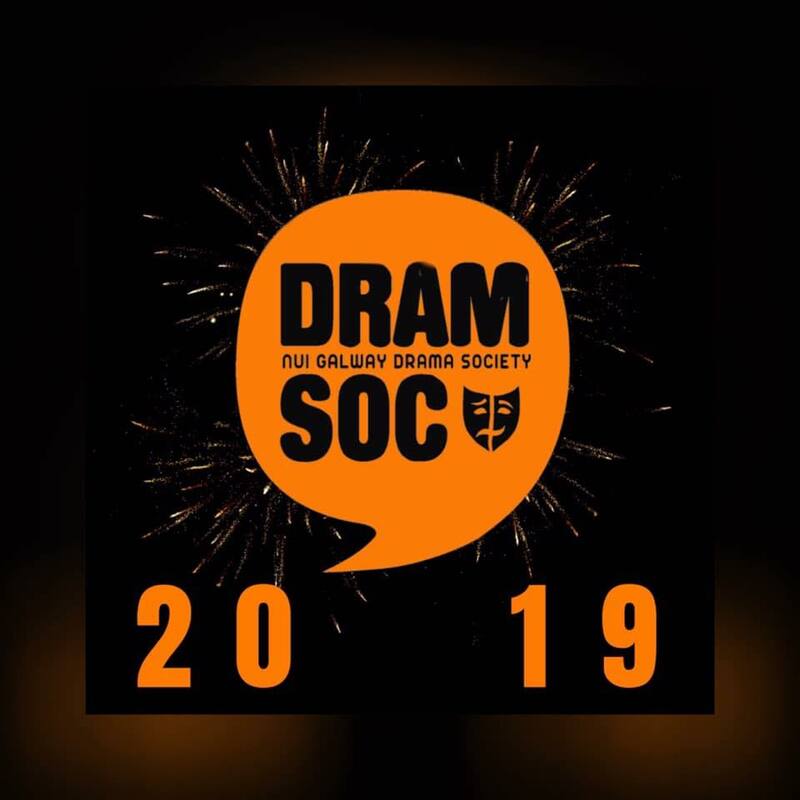 Mary Clare: It’s been a really busy semester but it’s great because if people are interested in getting involved, they don’t have to wait weeks before there’s an opportunity to do so, Dramsoc has shows and events going on literally every week. Any big exciting events coming up? Áine: Next semester, we have 4 shows, God of Carnage written by Yasmina Reza and directed by Claire O’Toole, The Box written and directed by Eibhleann Caffrey, The Language Archive by Julia Cho directed by Cristina Scobee, and Conversations on a Homecoming by Tom Murphy directed by Muireann Kavanagh. We also have our Jerome Hynes One Act play series during theatre week, which will feature five original one act plays. We will also be partaking in the Irish Student Drama Association festival again this year, as three of our shows will be chosen and sent to Queens University in Belfast to compete! We had a very successful ISDA in University College Cork last year and took home many awards and nominations, so we are very excited to be a part of it again. Mary Clare: And there will also be our annual theatre week where we’ll have events and talks with wizened figures of the theatre scene. What led you to become involved? Áine: I got involved in Dramsoc in first year when I got cast in the fresher play and I haven’t looked back since! I then became involved with countless more productions, I ran for committee in second year and was elected productions officer and ran this year and was elected Auditor! Dramsoc is a fantastic way to make friends and to try out different aspects of theatre that you have an interest in! It’s such a great platform to gain experience in acting, directing, writing, stage management, lighting, sound, set, costume, hair and makeup. Dramsoc give you the budget to put on your show and let you do the rest, it is a wonderful system as you have the comfort of having the Auditors to turn to if you need help, but you are also given a lot of freedom and resources to experiment with theatre. Mary Clare: I’m studying DTP (drama theatre and performance) so I knew of Dramsoc but was too shy to get involved. It wasn’t until second semester of first year that a friend directed a show and said that I could get involved so I assistant stage-managed Vincent by Daniel Cronin. From there I got to meet more members and was given more opportunities to get involved. Speaking of involvement, you’ve been in or involved with over three separate shows this year Ms Tehan, where do you find the energy? Mary Clare: Yeah, I was in The Last Days of Judas Iscariot and then designed lights for Devil’s Ceili directed by Vinny McBrien and In the Heights directed by Cian Elwood. They were all one week after another so I was fairly wrecked after those three weeks alright but when you’re in the mix and things are being set up, you don’t notice the time flying and before you know it, the show is done. I suppose what I’m trying to say is that it can be tough going the closer it gets to the show with late nights and that kind of thing but it’s worth it when you see the audience enjoying the final product. What in your time has been most rewarding about the experience? Mary Clare: My most rewarding experience was probably doing The Last Days of Judas Iscariot directed by Kevin Murphy last semester. I know I was talking about how there’s more ways to get involved than just acting but I was acting in this particular play. I just had so much fun with my characters and the whole production team and cast got on like a house on fire, everything from rehearsals to costumes to makeup was just so much fun, and it seemed to be well received which was the cherry on top. Áine: My most rewarding experience since joining Dramsoc… that is a hard one as there have been so many! Obviously being Auditor has been an exceptional experience thus far, being able to head a society that shaped so much of my first two years of college and means so much to me personally is wonderful. I absolutely love brainstorming ideas about events and shows, and working with the committee to continue expanding the society and making it more progressive and inclusive. The standard of theatre that we have produced this semester has honestly amazed me and it is so lovely to see everyone having such a great time doing it and making such good friends! I also have to say that Dramsoc has really shown me how much I loved performing, I’ve been lucky enough to stand on a Dramsoc stage seven times so far, and I have another two shows coming up this semester that I am so excited for! My favourite performance to date would have to be Alone it Stands, a play that we did last year and then reprised for last year’s ISDA festival. It was a hugely rewarding experience as it was such a difficult show to master but once we did it was very fulfilling and the audiences seemed to love it! And we also got nominated for best show at the ISDA festival so that was the icing on the cake! Moral of the story, join Dramsoc! You will not regret it.